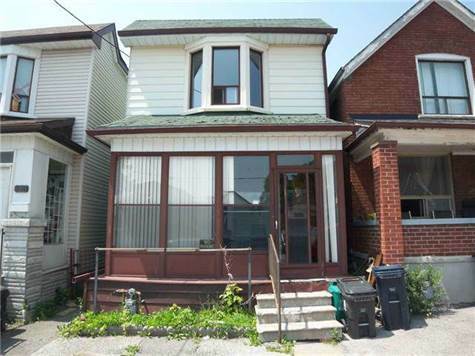 Toronto Real Estate Blog - GTA News : Beautiful 2 Story For Sale On St. Clair !! • 3 bath, 2 bdrm 2 story "Detached " - MLS® $450,000 - Ideal Toronto Location! St Clair/Old Weston , Toronto - Welcome To 310 Silverthorn Avenue! This Is A Great Family Location With Lots Of Potential! It Is An Ideal Area To Renovate! It Has A Good Size Backyard, Walk To TTC Bus Stop, Schools, Churches, and Park! The Kitchen Has A Good Amount Of Cabinet Space And Once Again, Great Potential For Renovations! The Bathroom Does Have A Few Major Upgrades To Undergo, However It's Perfect For Customizing It The Way You Like It! This House Is An Amazing Opportunity For Renovators And Investors! Make It Your Own! Some Other Extras Include Fridge, Gas Stove, All Electric Light Fixtures, All Window Coverings, Gas Furnace & Equipment! Welcome To 310 Silverthorn Avenue! This Is A Great Family Location With Lots Of Potential! It Is An Ideal Area To Renovate! It Has A Good Size Backyard, Walk To TTC Bus Stop, Schools, Churches, and Park!